Cingular's data service would not work but is working today. It is a cloudy wet day so we are staying in Kingston for another day. I went to Rotary this morning. It was the smallest group I have ever seen with only 16 members of which 4 plus 2 guests attended the meeting. We moved the boat from the Town Dock to Rondout Yacht Basin where there is a laundry. 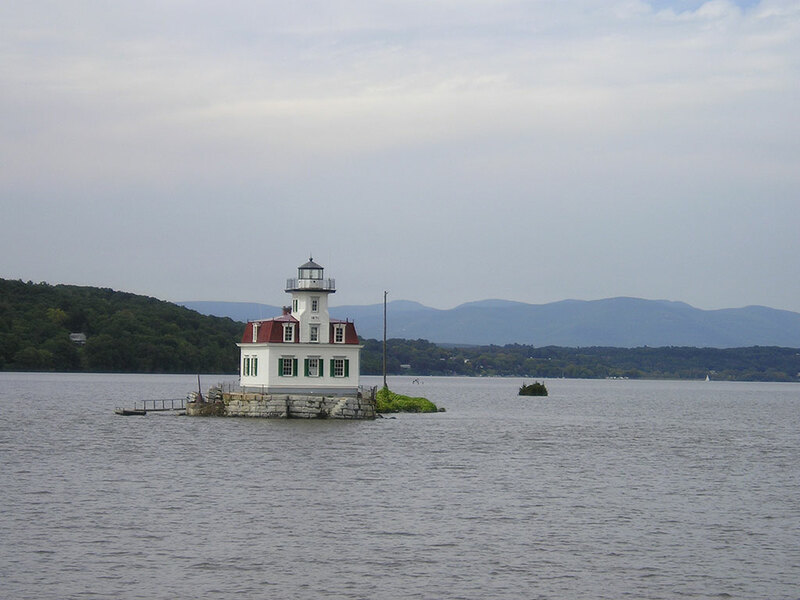 The photo is of one of 4 light houses in the Kingston area. A man on the dock came over and said he was looking for a boat like ours. He told a horror story about sailing with his wife from the Bahamas to Bermuda. He got in a big storm with 20 foot waves that lasted 6 days. After the 4th day without sleep he decided to launch his sea anchor. He got it in the water and yelled to his wife to shut down the engine so the boat would drift back. She didn't hear him and the boat ran over the anchor and fouled the prop stalling the engine. With 60 minutes of air in his scuba tank he went overboard and hanging on to the rudder cut the line taking 20 minutes but most of the air. Then his safety line slipped so he couldn't get back to the boat. His wife tried to assist and then she almost went overboard. Finally the got the line fixed and he was able to get back on the boat. They turned around and went back to the Bahamas. Now she doesn't want to boat anymore. I wonder why?